This is a bonus presentation tonight. I already reviewed Hop Karma Brown IPA for you tonight. But considering the Phillies' #MarchToThePennant now includes recently acquired ex-Astro pitching stud Roy Oswalt, I'm gonna give you another beer to celebrate the occasion! Yes, I went with Victory Prima Pils brewed by Victory Brewing Company in Downingtown, Pennsylvania. I've reviewed this beer before back last November, but the choice was based on the VICTORY name and the Philly suburbs location of the brewery. 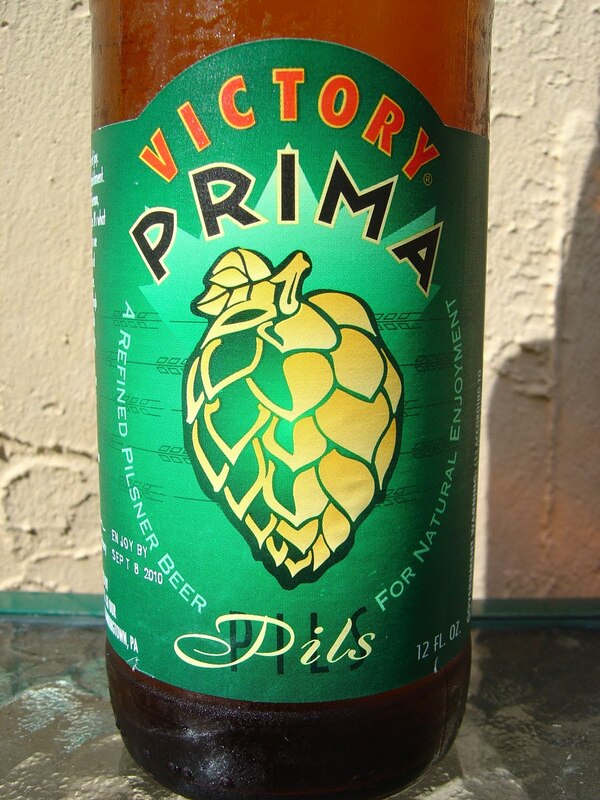 In fact, the label says "Prima! And exclamation of joy. A recognition of accomplishment." So let's get this show on the road and start by taking over first place and putting up an insurmountable lead. The label goes on to call this "A refined pilsner beer for natural enjoyment". Enjoy by Sept 8, 2010. Lemony, honey sweet, clean aroma. Fruity flavor start, apples and pears, light and not heavy. Very flavorful. Some citrus and lemon rind work their way in to make and keep this a lightly bitter beer. Next, a hint of spice. Medium carbonation, creamy smooth. Quite refreshing! I really enjoyed this beer. Do the same! GO PHILLIES! This beer was one of my 18 pack "sampler" I purchased nicea few months back. It has been one of my faves so far. Very nice warm weather beer. Hey bunny. Good beer, not my favorite style, actually least favorite style, but this one is good! Sorry for my typo above...I haven't even been drinking! My keyboard is all crazy on the laptop. Not a big pils fan either, but I was somewhat surprised with this one, too! Stuck in the Ft. Lauderdale airport with a flight delay now, on way to Philly. Hoping to find a few new awesome beers up there this week.